On October 12th the Metropolitan Police removed the dedicated uniformed guards from outside the Ecuadorian Embassy declaring that it is strengthening its covert plan. The MPS also said it will not discuss what form its continuing operation will take or the resourcing implications surrounding it. I hope this does not mean that London Assembly Members will be prevented from ask questions on the costs involved in the MPS operation that the London Tax Payer has to be burdened with. MPS states that despite the efforts of many people there is no imminent prospect of a diplomatic or legal resolution to this issue. “In January 2011, not even two months after Julian Assange had been arrested in London, a lawyer at the Crown Prosecution Service, Mr. Paul Close, strongly advised the Swedish magistrates against questioning the WikiLeaks’ founder in London. According to Close, the appropriate strategy was to interview him «only on his surrender to Sweden and in accordance with Swedish law». Isn’t this yet one more indication that both the Swedish and the British prosecuting authorities over the past five years have conspired to prevent the questioning of Julian Assange depriving him of the opportunity to prove his innocence and clear his name? Vaughan Smith of the Frontline Club (supporting journalists in the frontline) and a bail surety for Julian Assange says in relation to these new revelations: “What all this does, it prevents Julian Assange from getting the evidence that might protect him and prove his innocence into the public domain. The whole thing is a complete and utter scandal” and “Both the British and the Swedish prosecuting authorities appear not to want Julian Assange to have the opportunity to prove his innocence. It is completely scandalous; we are not all equal under the law”. They neither confirmed or denied whether any information within the scope of the request was held by the Home Office stating that it would endanger “the trust and relations between the UK and other foreign states and their relevant security services” if they gave a different answer. Government channels have been advising Britons on the left and right that the Assange case is a simple matter of the rule of law. In fact, it has everything to do with his role as Editor of WikiLeaks. Julian Assange has been granted political asylum exactly because Ecuador has found his life and human rights at risk due to his work. Interestingly, publicly, neither Swedish nor British authorities recognise that asylum nor the risks that Julian Assange is facing as Editor of WikiLeaks. Sweden refuses to guarantee that he will not be extradited to the US. The Swedish Prosecutor, Marianne Ny, refused to take into account these risks and question him in a timely manner and in a fashion to protect his life and human rights. Britain too refuses to recognise that Ecuador has granted political asylum by refusing to provide safe passage to Ecuador, instead is keeping him trapped. Still, the risks Julian Assange faces regarding not only his Human Rights but also his life are real. London Assembly scrutinises part of the public purse the Mayor has at his disposal. Will the Mayor now acknowledge this, years’ long, hypocrisy that has festered under his tenure and do the right thing by ending it. 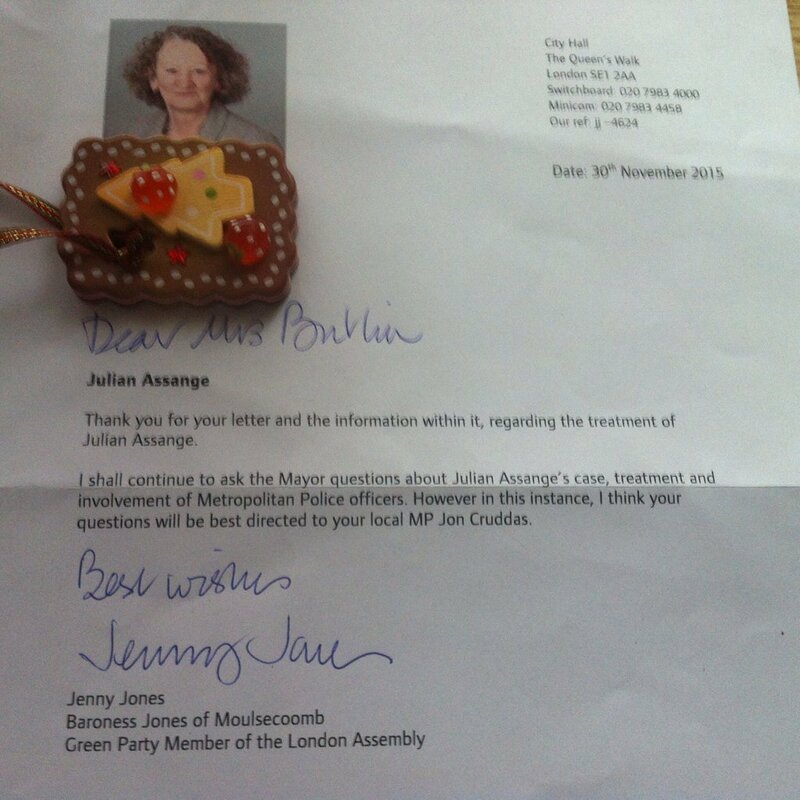 Will the Mayor enquire directly with the Home Office in seeking assurances that Julian Assange’s life and Human Rights will not be bargained against “the trust and relations between the UK and other foreign states and their relevant security services” but finally be respected? Will the Mayor stop the farce in which the Metropolitan Police has been asked to play a crucial role. Could he also enquire whether the Home Office has shared with the Metropolitan Police information regarding those assassination plans against Julian Assange that the Home Office is so reluctant to confirm or deny that they hold? Surely, this would be, truly, a simple matter of the rule of law.